James Popham, guru of assessment, was assigned reading when I was a K-12 educator, and used to usher in the era of accountability and a focus on “instruments” rather than students. Ironically, perhaps, this image comes from a web site devoted to cleansing the body. I do feel cleansed of Foucault after Popham. Before I get to Popham and her coherence and cohesion, I’d like to focus some on Carolyn Miller’s piece. You should see my marginalia! As a former communications executive who developed and used many professional writing genres (and templates … a discussion of this term and its relationship to genre seems to be in order), the idea of a genre as having a social purpose resonated well. She believes that a genre is characterized by its usefulness in communicating from one group (or organization) to another by means of expected and accepted forms and formats. As Miller notes, a genre has a purpose, an exigence, a reason for its existence and its use in a particular situation; it is not merely a summation of particularities, or a form one can notice. This goes beyond what many (Frye, Black, Campbell and Jamieson) who postulate a kind of internal rhetorical unity that denotes a genre (C&J) or a kind of one-way “transaction” (Black) that communicates to an audience via a set of strategies, diction, or linguistic elements (153). This is the more “literary” definition of a genre, one which many are more used to. A literary genre can ostensibly exist without an actionable purpose, although I would argue that a writer calls upon a genre for one or more exigences: to express, to woo, to join a tradition, to imitate, to enjoy a challenge, to play with language, etc. I doubt that anyone is ever truly without an exigency, but this is different from what Miller means by “social action”, whereby the listener/reader is called upon to do something, and the genre exists as a way of bringing together not only a linguistic form, but a group of people who will interact (discourse) around it. I was also piqued by this quote: “Thus, inaugurals, eulogies, courtroom speeches, and the like have conventional forms because they arise in situations with similar structures and elements and because rhetors respond in similar ways, having learned from precedent what is appropriate and what effects their actions are likely to have on other people” (152). This is part of Foucault’s historical a priori and also Vatz’s notion of what speech has come before as impacting the rhetor’s choices in responding to a situation. I submitted then when reading, and reiterated later in the essay, that analysis of discourse then becomes about deviance from the expected genres. This deviance (or aberration to use a network term … more later) may be interpreted as innovative (a sanctioned deviation from expected discourse, a lauded tweaking or hybridization of the genre) or as abject (beyond what is considered right or proper in terms of the use of the genre). I was quite intrigued by her discussion of Walter Fisher’s theories, which I spent some time looking out outside of the article, as I felt it would enrich my understanding. Fisher’s narrative paradigm seems particularly fruitful for further discussion, as he replaces argument with stories as the defining element of rhetoric, positing that rhetors choose among stories and narrative archetypes that match their values and beliefs. Stories, not logic, underpin people’s decisions, and reasons presented in rhetoric are subjective and may be misunderstood by audiences who do not share these same beliefs/hold these same stories. In an age of “truthiness“, where peopel have their own sets of facts and it’s more important what you feel or believe, and in an age where you can filter your discourse to only hear or be exposed to stories that confirm your world view, Fisher’s theories seem to have even more application than they did in 1984. I was also struck by the difference between Burke’s motive and Bitzer’s exigence that Miller outlined: “Burke’s emphasis is on human acction, whereas Bitzer’s appears to be on reaction” (155). This struck me as the same difference as teaching and learning, with Burkean thought focusing on what the teacher does and says, what is instructed or imparted or transmitted, while Bitzer’s notions are more focused on what is received or heard or learned. As Miller rightly notes, these are two different actions and interactions with a discourse or a genre, and they do not align always, even if both parties have the same general need or purpose. This idea was further reinforced later in the article when Miller brings up Sharon Downey’s discussion of two sets of rules: “constitutive rules that tell us how to fuse form and substance to make meaning and regulative rules that tell us how the fusion itself is to be interpreted within its context” (161). Thus, one set of ruels governs what is said and how, while another set of rules governs what is heard, interpreted and what it means. The potential for “disjunctive discourse” happens when these two sets of rules are not aligned. While this term is usually used linguistically to refer to syntactical issues that create semantic difficulties, I believe it can have a social meaning when two sets of operating rules — both valid — collide and the discourse breaks down in the absence of a mediator or translator that can bridge this divide (more network terms … more later). This whole notion applies to education because there, accountability has focused on the constitutive rules — what the teachers convey — but then measured the received messages without using teh regulative rules which govern what is interpreted. The problem lies with using the constitutive rules governing the rhetorical action as the basis for assessment vs the regulative rules that govern what is and can be heard or interpreted within context. The entire premise is incorrect, because rhetorical analysis (and what is teaching if not discourse) would state that what is said is not always what is heard, the action does not always create the intended reaction. Accountability focus on the students — why they didn’t hear or interpret or react in the intended way — would make sense. I also wondered if Pearce and Conklin’s five levels of rule-governed relationships might make a useful model for theorizing larp: archetypes, episodes, speech acts, propositions (grammatical utterances — Foucault’s statements? ), and stream of behavior that is interpreted … “based on the common physiology that human beings share and in the common physical properties of the world they live in” (Pearce & Conklin 78 qtd. in Miller 161). I would add the world they inhabit, as in the world of the game. Colbert, Stephen. “The Word: Truthiness” The Colbert Report. Comedy Central. 7 October 2005. Web. 3 Feb. 2014. 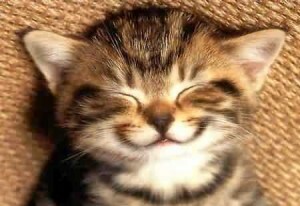 “Happy Cat”. Image from: http://www.slowfoodies.zzn.com/zlog/writeblog.asp?UserID=0012625225&Cat_ID=119062. Web. 3 Feb. 2014. Miller, Carolyn R. “Genre as Social Action.” Quarterly Journal of Speech 70.2 (1984): 151–167. Print. Munsch, Edvard. 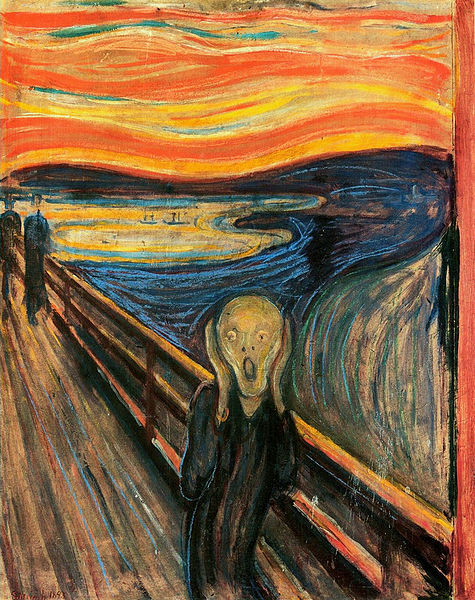 “The Scream”. from http://en.wikipedia.org/wiki/File:The_Scream.jpg. Web. 3 Feb. 2014. Popham, S. L. “Forms as Boundary Genres in Medicine, Science, and Business.” Journal of Business and Technical Communication 19.3 (2005): 279–303. CrossRef. Web. 1 Feb. 2014. A nice insightful discussion on the genre readings.